Today I’m honored to join Studio Katia 2nd Anniversary Blog Hop. 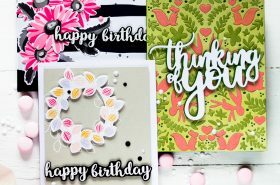 The Studio Katia May 2018 release includes 6 new Clear Stamp Sets and 4 sets of Coordinating Dies, 4 new stand alone Creative Dies, 2 new Stencils and new Embellishments. I’d been on the design team of this company from when it was a couple months old and cannot believe it’s already two years. I wish Katia and all the team to run smoothly and bring more wonderful products and inspiration. You probably came from my dear friend May Sukyong Park blog. If not – you may consider starting from the beginning at Studio Katia blog. For my first card I used extremely beautiful Lovely Blooms Stamp Set. I adore Studio Katia blooms and this one is no exception. I stamped the bouquet onto a watercolor panel and colored it using Arteza Watercolor markers. I added several white spray splatters to bring some interest (and simply because I add splatters on every single card lol). Next I die-cut a panel using a dotted rectangle die from Darling Ribbon And Dotted Frames Die Set and foam mounted it onto a white card base. I white embossed a sentiment from Spring Bouquet Stamp Set and popped it up onto the panel. Lastly I added several Snow Crystals. 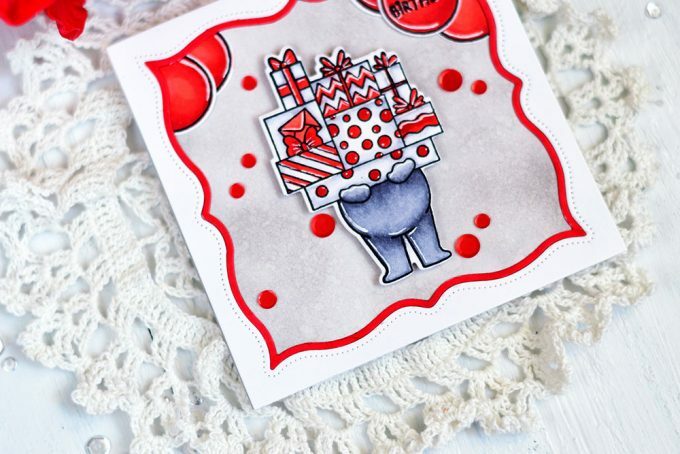 Studio Katia has a stamp series with an adorable Kobi bear. This time Kobi is bearing a gift pile. I couldn’t resist making a card with this set and my color combo of choice this time was gray and red. First I colored the Kobi and several balloons (from the same set) with COPICs and then die-cut them with the matching dies. I added some white gel pen accents to the colored images too. Next I made a squared card base and blended some Hickory Smoke Distress Oxide onto it. I made two balloon clusters and “hung” them from the top part of the card base. Then I die-cut a fancy square using a die from Dotted Patterns Fancy Square Die Set out of white cardstock. This die also die-cuts a fine frame, which I colored in red using a red COPIC. Then I adhered the square along with the frame onto the card. And foam mounted the Kobi in the middle. On this point I realized that I didn’t think through the sentiment placement (my typical mistake). Finally decided to add it to one balloon. I stamped it in black and them added shadows of white gel pen. Lastly I added a placer of red satin confetti I picked from Satin Rainbow Confetti. The next stop in the blog hop will be amazing Anna Kossakovskaya. If you got lost, please go back to Studio Katia blog. Svitlana, you’ve elevated these Lovely Blooms to breath-taken-away gorgeous! Vibrant, eye-catching, show-stopping! Thank you for the inspiration! What a beautiful bold card… Gorgeous! Beautiful work – so inspiring! 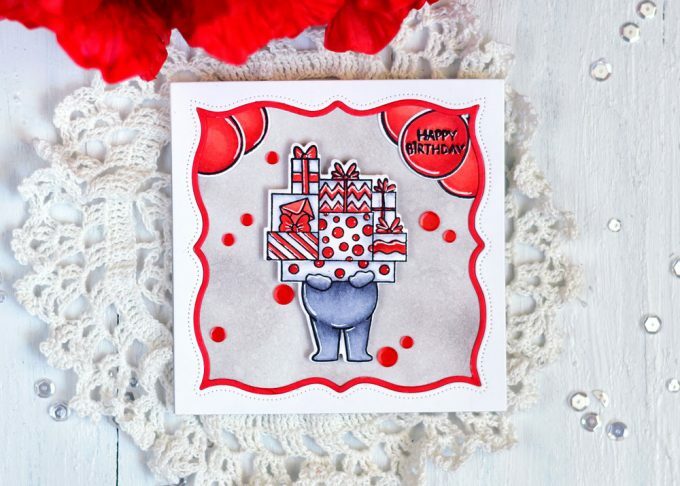 Lovely blooms andthe Kobi bear is great, love the mostly red and white theme to the card! Love the bold coloured flowers! Stunning! Your floral card is absolutely gorgeous but Kobi holding these presents wrapped in this irresistible polka dot Paper ! Nobody can resist !! I love love this large stamp! Its so beautiful. I love Studio Katia products in general. Your cards you made are stunning and adorable (kobi). Great job and Happy birthday Studio Katia! Fantastic cards, love your bold, bright colors! Lovely Blooms indeed Svitlana and you did a fabulous job colouring them. Love Kobi bearing gifts, what a sweet card. Well done. Great cards! Love the vibrant colors! I love the colors you used for the first card and adore the bright red of the second. Beautiful cards, thanks for sharing! I love that stamp of the bear hiding behind the presents. So cute! 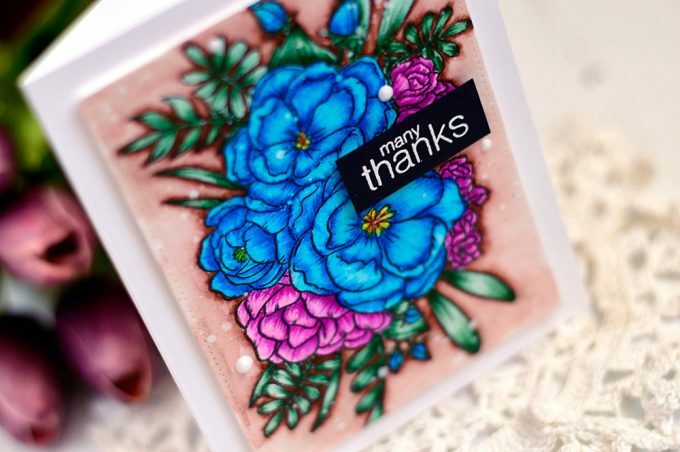 I just love the vivid colors you used on the floral card! Awesome! Your Lovely Blooms is beautiful. I really love the simple color choice for the Kobi Bearing Gifts. Thank you for sharing. FANTASTIC and very striking colours on both of your designs – I really like them! Thanks so much for sharing! Wow I love the colors you chose for the florals! That blue is so pretty! So nice to discover your beautiful work for the second anniversary of Studio Katia ! I already love this release and your vibrant colors sealed the deal! Beautiful!! I love both of the cards but the colors you used on those flowers on the floral card are GORGEOUS! Great job! Love both of these cards! So nicely done!! Your blooms are lovely but Kobe has stolen my heart! What a sweet card and adorable bear!! Wow your cards are both amazing. 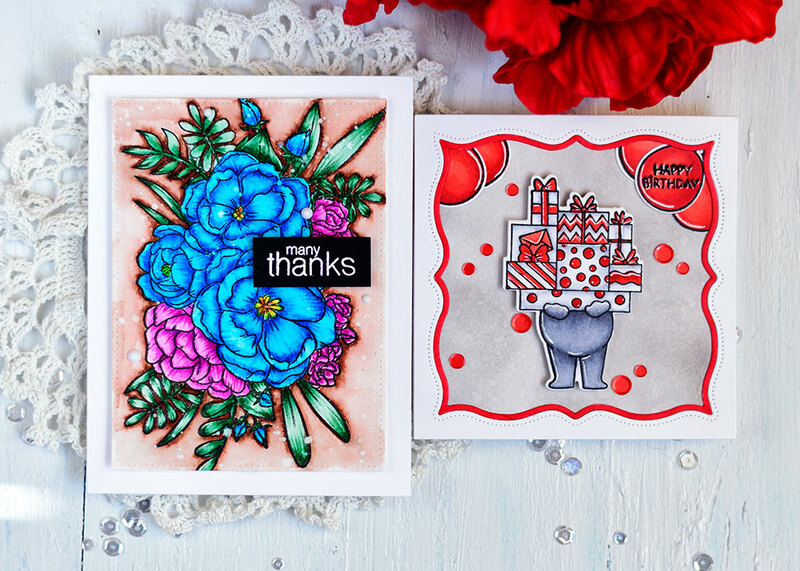 I just love the bright bold colours you used on the Lovely Blooms image, it is spectacular and I love the bold red in the birthday card, so fun! Awesome cards. The flowers are just gorgeous in blue. Thanks for sharing. Both cards are stunning, but I have fallen in love with the Lovely Blooms stamp set. Svitlana you’ve managed to make the Lovely Blooms even MORE lovely! I wonder who’s hiding behind all of the pretty packages! Your floral card is absolutely amazingly beautiful! Beautiful floral card. Your colors really pop! I love the floral car – The shading around the flowers and the background make the florals pop! card is with the flowers! All your cards are so breathtaking! The floral one is so vibrant and gorgeous and the bear with presents is just too cute! Loving seeing all the inspiration and exciting to be celebrating 2 years! I love that beautiful floral card. Beautiful floral card! Love the colours! I also love the card with the bear holding the presents!! TFS!! Beautiful floral card! Love the colours! I also love the card with the bear holding the presents!! Thanks for the inspiration and TFS!! 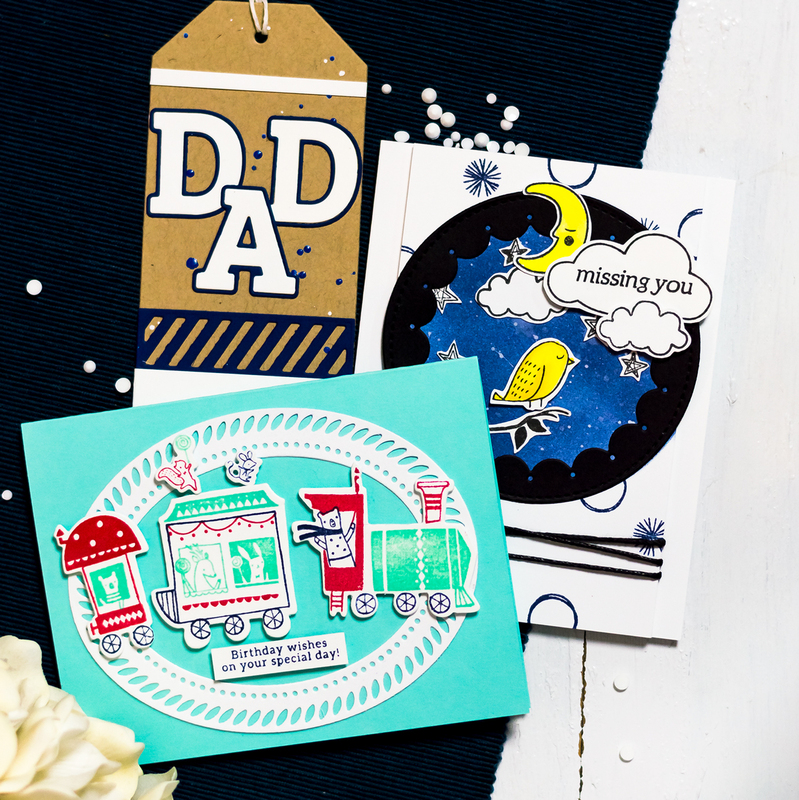 Your cards are bold, joyful and sweet. Kobi bearing presents is so adorable, and the floral stamp allows for so much creativity which I am noting as I go from one artist’s blog to another. 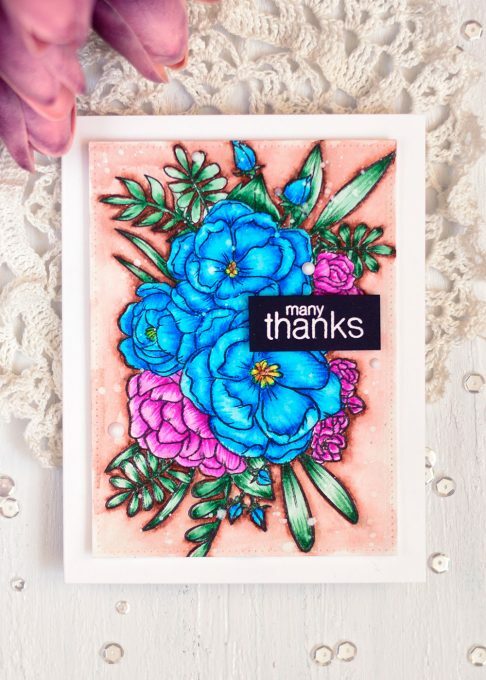 I like how you used the Arteza coloring markers on the floral card. So vibrant! Your flower colors are gorgeous. Amazing bright colours on the Lovely Blooms card. It’s one of my favourites. You amaze me! I am loving the bold and vibrant color choices on the floral card. (It’s really lovely, isn’t it?) I totally fell in love with the bear, and like how you used balloons to create a very festive party feel to the card. Thank you. Your coloring on the flower is breathtaking. Thanks for sharing. Your. LOVELY BLOOMS are stunning and the HAPPY BIRTHDAY card is so cute. Absolutely beautiful coloring on the flower blooms. Both cards look so nice! Love the bright florals! Both wonderful cards. I gotta say, though, that bear with arms full of gifts would make a great Christmas card or tag! Your flowers are just stunning! And your bear is adorable! Great cards. love the bright colors. Thanks for the inspiration. Man that blue flower is gorgeous! I love seeing the use of the watercolor markers. So beautiful! Wow!!! Gorgeous cards!! Love these new stamps!! These flowers are so bold and I LOVE how they stand out from the lighter background – just gorgeous! The flowers are stunning! I love your color choice for the flowers. Your colors are stunning in the first card! I love your vibrant blue flowers; such a lovely stamp; also adore the cute bear card. I really like the Coloring on your Kobi Bear card! 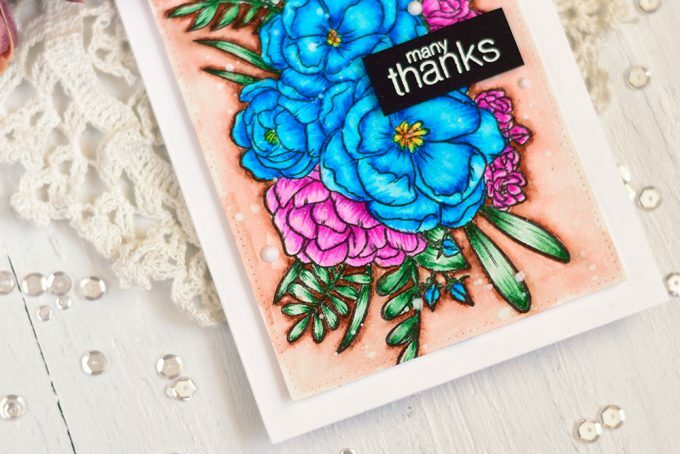 Really love the coloring and the colors you chose for the floral card, so striking! I love the opening on the second card too! Absolutely amazing. The colors really catch your eye. Love them the cards. These cards are so vibrant and eye catching. The Studio Katia flower grouping is the perfect image for a flower lover like me! 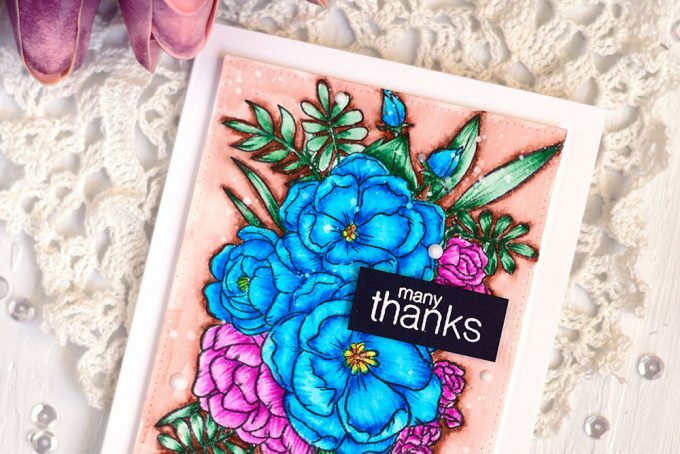 I love the bold vibrant colors you used on your Lovely Blooms card! The flowers look so real! The kobi card is truly adorable! Great designs and they show such a good variety of styles! I love how vivid the colors are in your floral card! I love the floral card! What gorgeous flowers– colors are so vibrant! Hi there. 2 such different and fabulous cards!!!! Love them both and thanks so much for sharing with us. Love the new Studio Katia release – HAPPY BIRTHDAY STUDIO KATIA. I especially love your beautiful coloring on the gorgeous floral image!! I love both of your cards. The floral card is so vibrant and beautiful. 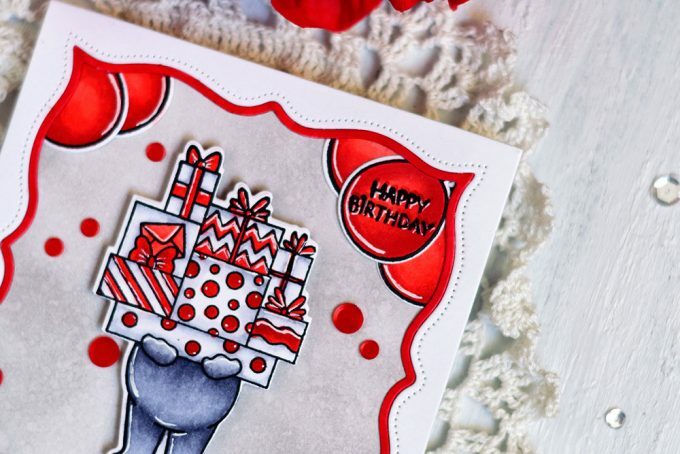 The little Kobi card is just so interesting and different – I love the cut-out shape and how the balloons are at the edge – it is just such a cool card! Love your cards. Great color choices on the floral. Thank you for sharing. Awesome cards! Love that beautiful floral design, and Kobi is a favorite! So lovely cards, thank you for sharing them! Happy 2nd anniversary Studio Katia! Love the colouring on your cards. The second one reminds me that it could be a valentine card, hearts and circles are great for Valentine. Wow! The colors make such a totally different look. They really pop! Thank you for sharing. Beautiful cards! I love the blue flowers, and the other one is really cute! 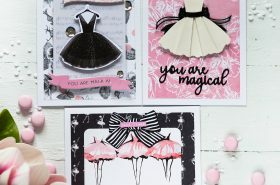 I love your beautiful and bright cards ! These stamps are beautiful ! Love the colors you used in the flowers. So bright and summer like. Thank you for sharing your talents with us. How wonderful cards ! I love the colours used on the flowers, Beautiful ! Those vibrant colours are AMAZING! I love the brightness of your two cards! Great cards. I love the bear card. Such a beautiful card, love the vibrant colors! Awesome cards. Love those flowers! Both cards are very lovely and beautiful!! Lovely cards! Really like the vibrant colors. The red really pops on your second card! your color choices are rich and amazing. thanks for doing them that way!! Amazing! The colouring in the flowers is fantastic! Gorgeous card! Thank you so much for sharing! 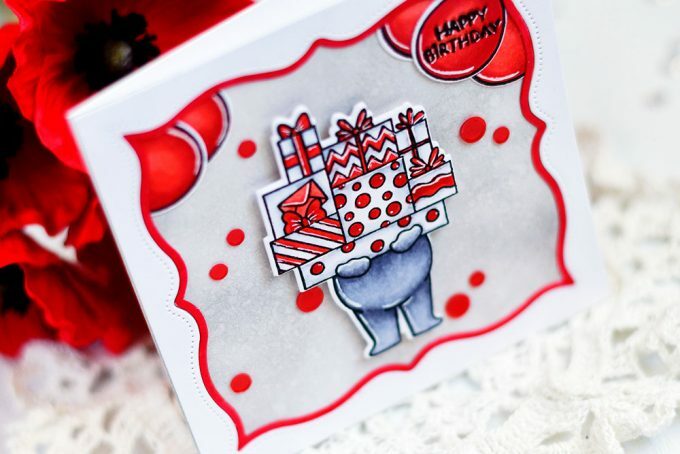 Your cards are awesome, the flowers are beautiful and the bear is “generously adorable” ! I absolutely love your coloring on the flowers! The stamp set is pretty great too. Thanks for your inspiration! Gorgeous cards! I absolutely love the colors! You made everything just pop! Fantastic cards! I absolutely LOVE that new Kobi bear stamp!!! Your flora card is so beautiful. Terrific job in coloring the flowers. Mr. Kobi, the bear is darling. I like how you designed the background (corners) of this card. I LOVE the birthday card! The bright red is PERFECT! Love your bold colors. Those cards will brighten someone’s mailbox! While your floral card is pretty, I love your Kobi the bear and his many presents! Thanks for sharing. Your use of bold color is so invigorating!! They scare me a little, but you totally rock it! That little bear is adorable! I absolutely love the florals, so bold and bright. Your coloring is amazing! These flowers just pop! I just love those flowers against that soft peachy background – they pop right off my computer screen! 🙂 You showcased two beautiful cards here and I love both of them! 🙂 Thank you for sharing with us! 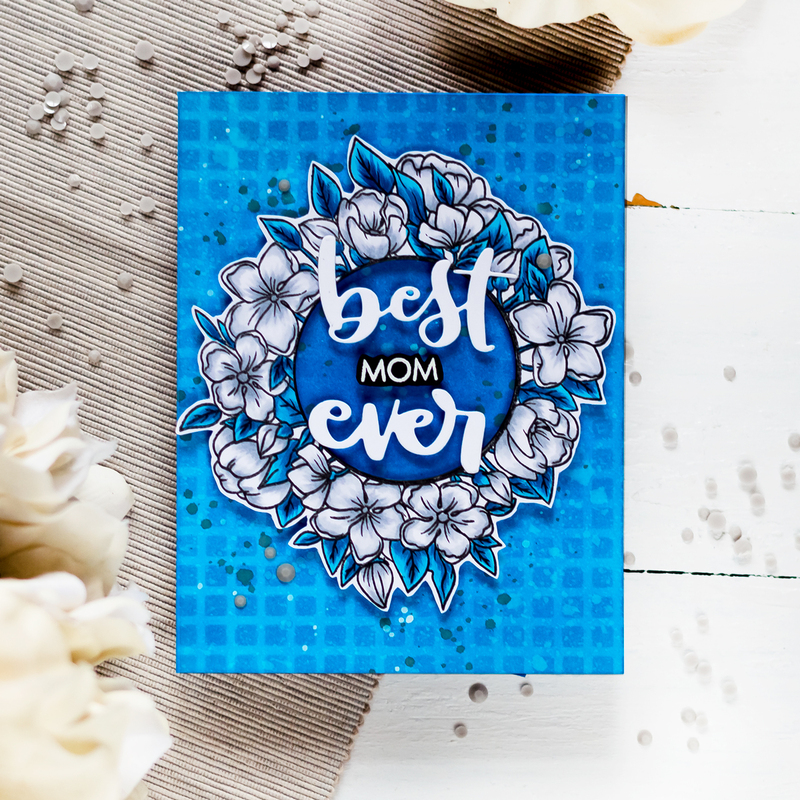 Love the vibrant blue flowers on your first card! Your second card, featuring Kobi, is adorable! The gray and red color combo is so pretty, and that frame is fabulous. Stunning card! So wonderfully vibrant and beautifully colored. Such vibrant colors on the first card, and great color combination on the Kobi bear card. The cards look so gorgeous! Such vivid colors! It is nice to see such a beautiful flower spray colored so many different ways. Lovely cards! I love that grey and red combo! Perfect for all those gifts! This is a great set for so many different occasions! Love the huge floral in this release as well! Congrats on your 2 years! Svitlana, you’ve showcased the Lovely Blooms just beautifully! Wow! Love the vibrant colors you chose for the blooms. And the way colored them. Stunning! Love your rich vibrant colors! Your amazing coloring makes everything look so real! Just gorgeous! And what a great new release by Studio Katia- Happy 2nd Birthday! So pretty. Love the flower cluster arrangement. I have such a horrible time trying to do my own flower arrangement out of stamps. So this stamp is perfect. And I love the red on the birthday card and presents, so bright and vibrate. Really makes the image pop! Such gorgeous flowers! Love the colors! I love the cards – the floral card is strikingly beautiful! These are beautiful. I love the bear and the balloons. Very beautifil cards. Love the colors!!! very cute cards, lovely coloring on your flowers. Pretty colors on the floral card and I like the framing on the second card. Your floral card is stunning, Svitlana. Gorgeous colors. Wow! Just love how vibrant your cards are. Card goals! I love your cards! Such bright and fun colors! Wonderful coloring as well! Wow! Those florals are so bright and stunning! The floral stamp is my hands-downs favorite, but you have shown me there is a lot to love in Kobi Bear. He is cute, but not so cutesy that he couldn’t be used across age groups and even seasons. Thanks for sharing your talent with us. Your card made my day. The flowers and your coloring are gorgeous. Lifted my spirits on a dreary damp drizzling day. Your coloring on the flower is so beautiful! I love how you used the balloons on the bear card, so fun. Just gorgeous flowers!!!! Thanks for sharing!! 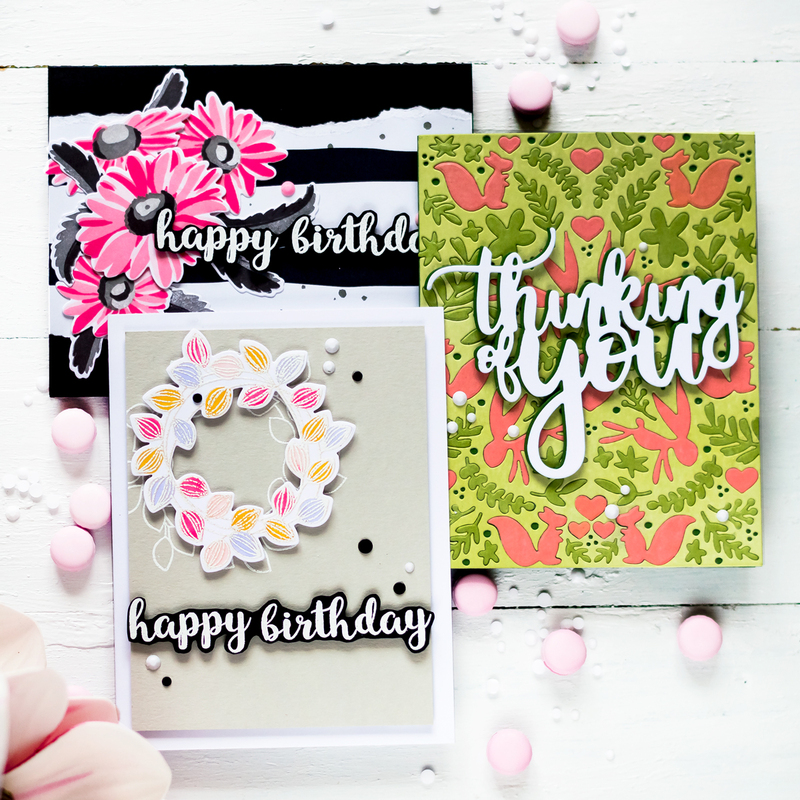 The Lovely Blooms card is just gorgeous! I love the blue flowers!! Lovely cards. The red card is darling and quite unusual. Beautiful and bold colouring on the florals. These are lovely cards. 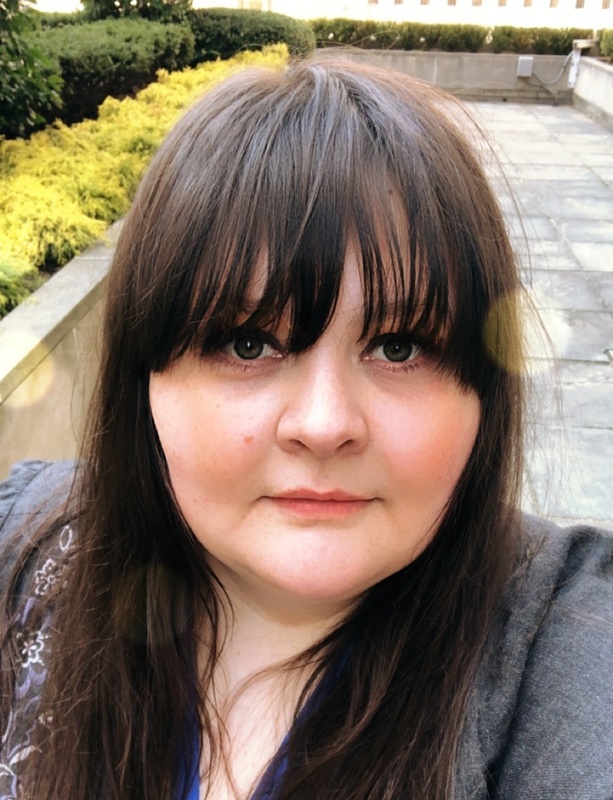 I love the new products and you’ve shown them off beautifully! Lovely cards! Love your bright colors! TFS! Svitlana, I love the little bear bearing gifts on your card he is absolutely adorable. Please can you let me know your birthday so that I can send you one of my handmade cards on that day. I have set myself a challenge to see how many of my handmade cards I can send out in 1 year. I presently have sent out 90 cards and that is 90 recipients I have made smile, when they smile, I smile too! I love the Kobi card, the colours are a fantastic combo….. I am so inspired. Beautiful cards and I love the flowers! So bright and pretty against the peach background. Beautiful job. The die that you used to frame the bear holding all of the present boxes is so very elegant and pretty! Great idea with the balloons! Love the colors on the flowers on your first card. So vibrant and pretty! Love how bright your cards are. That floral stamp is just gorgeous! Two great cards love your coloring. Thanks for sharing. Fantastic cards! Your flowers are beautiful and I love the bearing gifts card – so adorable! 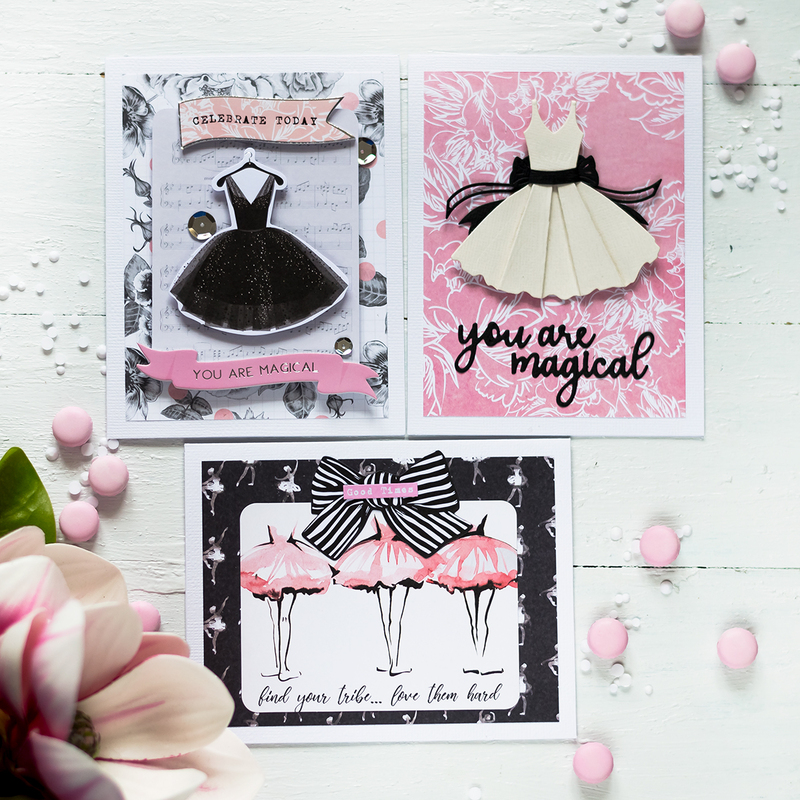 Such fun gorgeous cards. Thank you for sharing. Your cards are so pretty. Thanks for the inspiration. Such gorgeous cards! Love the colors you chose!